Given the apparent role of TPM in co-ordinating blogging efforts on the left, I thought it worth my time to bring attention to one article – one talking point, if you will – that sprung up on the TPM web site a few hours ago. Titled “Rand/Thrasymachus, Marx, and Dostoyevsky“, I thought perhaps I might find in the article something of value. Instead, the article’s author, who goes only by the name Nebton, provides the reader with misrepresentation after misrepresentation in an effort to support one talking point: that Ayn Rand’s ethical philosophy (rational egoism) is just a rehash of philosophy from ancient times. 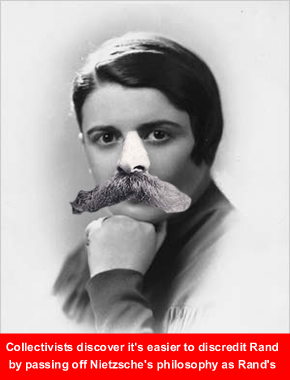 Implied: don’t bother reading Ayn Rand when considering the nature and causes of the current economic crisis. To be fair to Nebton, a few things should be acknowledged. Nietzsche, before Rand, provided an history of morality in which morality, thousands of years ago, was inverted. That which used to be considered a virtue was condemned as a vice, and that which had been considered a vice was praised as a virtue. Pursuant to the inversion, the strong, the knowledgeable, and the wealthy were considered to be the most vicious, whereas the weak, the ignorant, and the poor were considered most virtuous. It was an easy sell, in some ways, because it takes no effort to be weak, ignorant and poor and because whereas under the old ethics such people would feel guilty about their situation, the newly-inverted ethics allowed them to feel superior to the strong, knowledgeable, and rich. That ethics – the ethics that treats the economically successful as those who “owe society” or who must “give something back to society” – remains dominant today. It is still easier to remain weak, ignorant and poor and to take values from the ‘sinners’ who produce them than it is to improve oneself and create values for oneself. Altruism, in short, remains a popular rationalization for that which the ancients considered vicious. However, Nietzsche made a horrible mistake. He equated altruism with morality and, having done so, proceeded to reject morality altogether as something that is merely a weapon used by clerics to overthrow the otherwise strong, intelligent, prosperous and powerful, and thereby to rise to power. In other words, he threw the baby (ethics) out with the bathwater (altruism). He thereby contributed to the current wave of moral subjectivism that haunts our educational and governmental institutions. And, by denying the propriety of ethics, Nietzsche actually failed to oppose, meaningfully or effectively, the de facto altruism inherent of most of the purportedly amoral (e.g., “pragmatic”) acts committed in society today. Ayn Rand did not make Nietzsche’s mistake. Her message was not that man must get “beyond good and evil”, but that man must properly identify, by Objective (hence rational) means, what is good and virtuous on the one hand, and what is evil and vicious on the other, and that – to live life as a Man on this earth – a human being must seek the good by virtuous means. Unlike Nietzsche, Rand’s philosophy effectively condemns not only altruistic philosophy, but also altruistic acts that are promoted or carried out by people who claim such acts to be amoral. Hence, nobody condemned altruism more – and more effectively – than Rand, yet it could equally be said that nobody praised ethics to the degree she did. I juxtapose Nietzsche and Rand in this way for a reason. Too often, those who condemn Rand’s philosophy pass off Nietzsche’s arguments (or inferences drawn from them) as though they were Rand’s; they falsely equate Nietzsche’s philosophy with Objectivism. They then proceed to condemn attempts by the strong and intelligent to obtain wealth and power by means of coercive physical force and fraud. There is nothing wrong with that: attempts to obtain values by such vicious means are indeed efforts that are properly condemned. However, what such authors either fail to appreciate, or refuse to be honest about, is that Rand’s philosophy – unlike Nietzsche’s – condemns such actions as vices, not as virtues, and it does so whether the person engaging in such actions is strong or weak, intelligent or moronic, rich or poor. Ayn Rand’s “selfishness as a virtue” is not a new idea. The Greek philosopher Thrasymachus voiced a similar idea, commonly translated as “injustice is virtue”. Clearly, this quotation describes a line of thought that runs contrary to Rand – who expressly praised justice as a virtue – but that arguably is consistent with Nietzsche. Rand explicitly rejected the notion that it is natural for man to get what he can by any means: man’s nature, she argued, required him to obtain values only by rational means, hence without recourse to coercive physical force and dishonesty. Morality was not, to Rand, an “obstacle” to be overcome: such a line of argument brings to mind not Rand’s John Galt, but Nietzsche’s Overman/Superman. Rand, to the contrary, regarded ethics as something without which man cannot identify and effectively pursue the values upon which his survival and happiness depend. Note that, to that point in Nebton’s essay, he has not provided the reader with a correct representation of Rand’s philosophy at all. Instead, he has stated that the ideas set out in the passage he quotes from an history book are “a similar idea” to Rand’s. As I explain above, the ideas quoted in that passage are not only dissimilar to Rand’s philosophy, but are diametrically opposed to it. Which assumptions did Marx make that were “untenable”? Nebton does not say (which is not to imply that Marx did not make untenable assumptions). However, one author I think had a much better grasp of human nature, despite preceding them both, is Fyodor Dostoyevsky. In Notes From Underground, he makes the excellent observation that if some genius were to discover a set of scientific principles that would make each of us perfectly happy (an idea that was inspired by reading Charles Darwin’s On the Origin of Species), we would not follow these principles, because we cannot be truly happy following any rules. Although perhaps not rigorous from a logician’s perspective, he effectively makes an argument reductio ad absurdum that no set of rules will ever make us happy, and that’s true whether it’s completely free-market capitalism, Marxism, or a semi-regulated semi-free-market capitalism with quasi-socialistic safety nets thrown in (or however you want to describe our current system). Of course, one could argue that neither Rand nor Marx were interested in happiness, but were pursuing other goals for us, such as freedom. If there is any one sentence in Nebton’s essay that proves he has not read a single word written by Rand, that just might be it. Rand’s position was that ones own happiness is ones highest purpose in life. Freedom – freedom from non-consensual deprivations of ones own life, liberty and property – she explained, was simply the condition necessary for one successfully to pursue that happiness. Ethics, Rand explained, is what makes freedom a value: ethics precedes such political concerns in the logical hierarchy of knowledge. Furthermore, Rand’s disciples might argue that their Way is one of No Rules, just as many an atheist will argue that their Way is one of No Beliefs….As you can probably guess, I don’t buy into the “No Rules” argument as the strongest will always make rules (refer back to Thrasymachus). Rand was an opponent of anarchism. Her “way” was not “no rules”, but rational ethics, and a government that removes barriers to ethical (hence ruleful) conduct by making and enforcing rational laws. I fully suspect that, with Ayn Rand’s novel “Atlas Shrugged” smashing all previous sales records and placing itself in Amazon’s #1 spot in recent months, we will see stepped-up efforts on the left to suggest to prospective readers of the novel: “Move on people, there’s nothing interesting to see here”. A hint to the collectivists engaged in such efforts to diminish Rand’s growing popularity and influence: if you want to maintain a shred of credibility, you might want actually to read what Rand wrote before attempting to trash it. Feeble efforts like Nebton’s will only speed up the public’s acknowledgment of the fact that the collectivists lack a logical argument to defeat Rand’s philosophy. Spot on, Paul. Your explanation of where Rand and Nietzsche differ is as clear as it gets, and I think your assessment of what the Collectivists are attempting to do here is 100% accurate. Well done. Do you also have commentary on the commentary given to the article you wrote this about? Hi Tjitze: I’d written my blog post before anyone had posted a comment to the original article, so I did not comment upon those comments. However, now that you’ve mentioned it, I have gone back to look at the comments. The first one, by jwrock, is good. Very well written, Paul. I saw nebton’s piece earlier this evening, and responded with the question whether he had read Rand and could support his interpretation with quotes. Of course he can’t, but I always like to get that established up front. Someone named ‘sklein’ now has a much better response to him. Thank-you Ardsgaine. I had a look at your blog: nice. I’m adding it to the blogroll on this blog. Cheers. Thanks Paul. I’ve added you also. But seriously, I do appreciate much of her philosophy, even though I find it incomplete. There are aspects of it that are derivative, but she also brought a freshness to some of the ideas, which is one reason she has garnered such a following. I also enjoyed the two novels of hers I’ve read (no, I never claimed to be an expert on her). If funding the government is completely voluntary, then ultimately compliance with laws will be voluntary, as well (at least by those with money). That either results in plutocracy or anarchy, but not freedom. Assumptions that very rich people (or corporations) will not use their control of the purse strings to manipulate law enforcement is one of those assumptions about human behaviors I think is flawed. I’m not exactly “on the left”, either. Possibly like you, I consider myself to be a “radical moderate”, meaning that I subscribe to no party’s doctrine. I agree with Rand’s (and Aristotle’s) philosophy of using rational thought to arrive at one’s own conclusions. Nebton, Do you mean that complacence with justice would be voluntary for those with an army of lawyers? Maybe it would be if the enforcement of laws depended on their interpretation but Objectivism advocates objective unambiguous laws. How would they pull the strings of a law enforcement witch deals out punishment D when offence Y has been purportrated? And how could a corporation pull any strings when economics are completely separated from the government? It is when the government has the power to favor one corporation over another that ”string pulling”’ enters the picture. This quote is very true of Rands minarchist views…..and has been mine for many years. But lately I have been wondering how a third person (government) can make the decision of what is rational. Every government in history thought they were rational. All governments, even a small government , has to threaten violence & initiate force to have their laws obeyed. Who is the government to tell me I have to pay for police & military, if I say I don’t need them? “Demonstrably” by who……..to who? What if I disagree…but live a non-violent life. What if I “would (& should}’ NOT be willing to pay? Who is going to be initiating violence now when the legal system (& eventually armed police) come to punish me for not paying the government demands upon my freedom? We loose our moral standing when we condemn big government but think that small government should have the same oppressive powers. Instead of “rules” perhaps “principles” when referring to ethics. Epistemologically, it’s the inability of such people as Nebton to think in principles that both prevents him from accurately recalling precisely what Miss Rand wrote and, thus, leads him (and others) to make such sweeping (and erronesous) claims about her philosophy. Great so the argument as usual comes back to what one should regard as rational, ethical and moral. Very enlightening (not to say that Nebton wasn’t taking liberties in making his/her argument).